Eleven years ago, the Co-ed Slayer murdered nine female students on the Oregon State University campus. Lacey Campbell barely escaped his attack, but lost her best friend whose remains were never found. As the sole surviving victim, Lacey helped send the sadistic serial killer to prison for life. Now a forensic odontologist examining teeth and bones for the state Medical Examiner, Lacey is devastated when she arrives at a crime scene and identifies the skeletal remains as her college friend’s. The remains are discovered on the land of ex-cop Jack Harper. Sparks fly between him and Lacey, even as they realize that the prosecution’s witnesses from a decade ago are now being murdered one by one. All the evidence points to the Co-ed Slayer as the culprit—only, he’s long since dead. So who’s the new killer? And is Lacey next in line to die? Golden Heart finalist Kendra Elliot combines chilling suspense and steamy romance in a gripping tale, uniting in-depth forensic knowledge with a passion for thrillers. 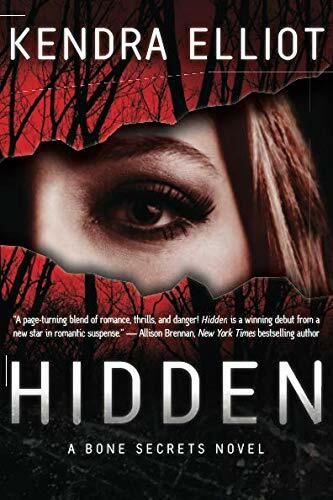 Set in the snowy winter of Oregon, Hidden creates spine-tingling chills.